When Aarhus was named European Capital of Culture for 2017, even the most travel-obsessed among us were a little baffled. Where on earth was it? And what exactly can you do there? Luckily, I had accidentally been to Aarhus in October 2016, and was on-hand to answer such mystifying questions. And how did I manage to accidentally go to Aarhus? Well, I was travelling overnight by cruise ship from Helsinki to Stockholm with my husband David, when an unexpectedly strong storm blew in across the North Sea. With the ship rolling about erratically, docking in exposed Stockholm was impossible, and so we were diverted to Aarhus instead. At that point I too was baffled. I didn’t even know which country we were headed for. 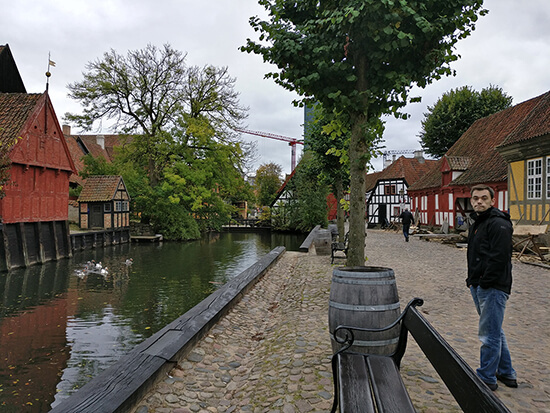 But, after a quick Google search on the ship’s limited satellite internet, I had all the facts, and couldn’t wait to set about exploring Denmark’s second largest city after Copenhagen, especially as I had heard it was a great place to sample some Danish delicacies. Aarhus’s population of 330,000 makes it a small city by European standards, but this gives the streets a peaceful, unhurried feel. Indeed, on first arriving, at some horribly early hour in the morning before the commuters were up, we headed straight to the nearest café for coffee, breakfast and a Danish pastry or two. We ended up at La Cabra, a stylishly modern coffee bar in the Latin Quarter serving artisan cappuccinos and freshly baked cinnamon pastries. Aarhus’s Latin Quarter, a region of perky, semi-timber-framed houses and narrow, cobbled streets, is chock-a-block with independent cafés and Scandinavian fashion boutiques, making it a great place for a wander. After some serious window shopping and a moderate case of food envy from those sitting al fresco eating toasted rye bread and bacon, we walked along the pretty canal to the city’s Botanical Garden. 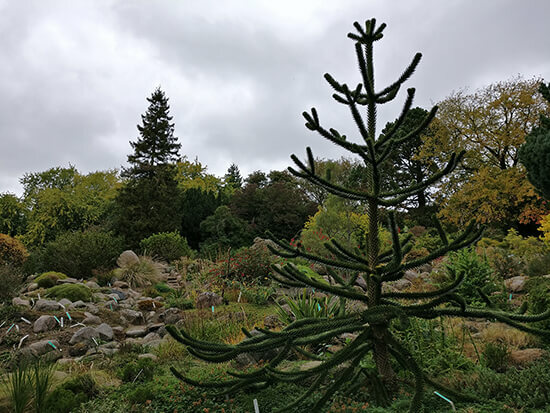 This peaceful green space contains plants from all over Denmark, plus four greenhouses showcasing flora from different environments such as deserts and mountains. Meandering slowly through the shrubbery, we followed a delightful stream-side pathway that took us to Den Gamle By, the city’s stand-out attraction. Den Gamle By is an open air museum, and a very interesting one at that. We spent a good many hours looking around its houses, which ranged in period from the 1860s to the 1970s. Each one was sourced from around Denmark, brought here and reconstructed. Some are decked out as traditional homes, some are for trade – we saw a coffin maker, a shoe maker, a carpenter and a bakery where you could taste the freshly baked rolls. 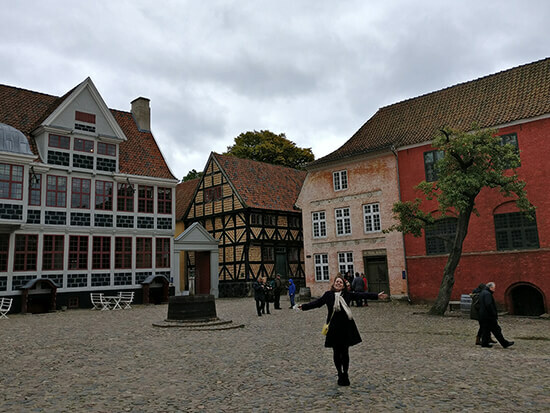 Not only does Den Gamle By offer an insight into the history of everyday life in Denmark, but it’s also an especially attractive place, with cobblestone squares, colourfully painted houses and gardens brimming with herbs and flowers. Soon we stumbled across a cute-looking tearoom, so stopped for lunch. 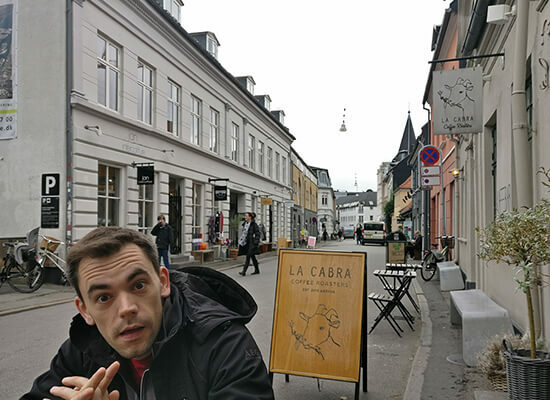 Here we took the opportunity to try one of those Danish delicacies I mentioned. I had smørrebrød, a slice of buttered rye bread topped with salami, pickles, beetroot and salad, while David opted for meatballs. 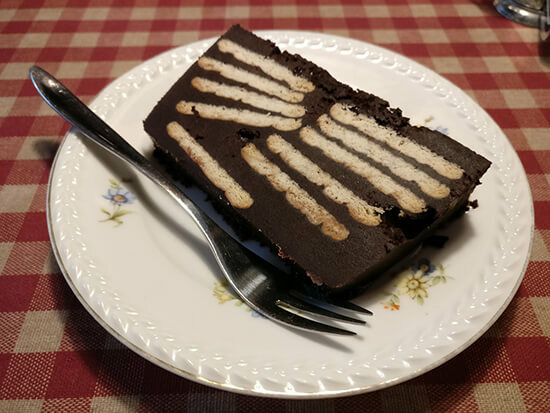 We followed this up with a slice of kiksekage, otherwise known as hedgehog slice, an uncooked cake made up of layers of biscuits and squidgy chocolate ganache. It was completely decadent for a Tuesday lunchtime of course, but we threw caution to the wind and washed it down with traditional Danish ale. After lunch, feeling rather full but enthused by all the history, we took a look around the Toy Museum where, much to my husband’s delight, we found retro arcade computer games, Gameboys and Teenage Mutant Ninja Turtles-themed merchandise. 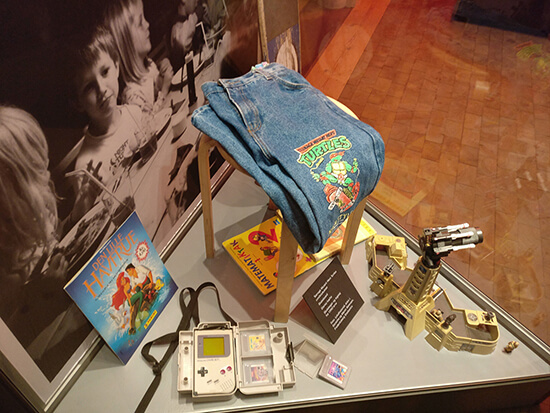 Seeing things we owned as children encased behind glass in a museum made us feel very old! Our final stop in Aarhus was the ARoS Aarhus Kunstmuseum, the oldest art museum in Denmark outside of Copenhagen. The museum was established in 1859, and includes pieces by Andy Warhol and Roy Lichtenstein. 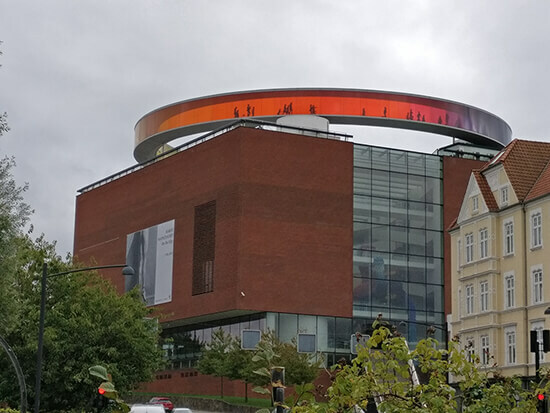 But for us, the main attraction was the Your Rainbow Panorama installation by Ólafur Elíasson. Completed in 2011, this giant circular skywalk, 150m in circumference, wraps itself around the top of the museum, its coloured glass walls the only protection from the long drop below. While we didn’t walk around it ourselves, we could clearly see the silhouettes of those who did from street level, an intriguing and somewhat futuristic sight. 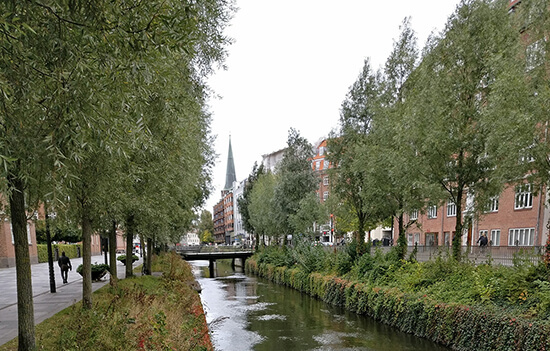 It’s a shame that we couldn’t stay in Aarhus for dinner – we had to get back to our ship – because the city is an up-and-coming foodie paradise. Indeed, as well as being 2017’s European Capital of Culture, the city has been named the year’s European Region of Gastronomy as well. Long gone are the days when Copenhagen and its world-famous Noma restaurant took Denmark’s eating crown. These days Aarhus is home to no less than three Michelin-starred restaurants of its own as well as numerous funky bars, cafés and less bank-breaking eateries. There’s a real emphasis on home-grown produce too, with many chefs using not just Danish-only ingredients, but Aarhus-only ingredients, as well as doing their own beer brewing and vegetable pickling. The locals love to eat – I only wish that we could have joined them. Make an appointment with one of our Travel Experts to start planning your European city break to Aarhus.